As you probably know, AIX-Seattle is a US version of the big Aircraft Interiors Expo in Hamburg each year. We suspect Seattle is the chosen venue because of Boeing (who does not exhibit but sends representatives; however, that is another story) and parallels the one in Hamburg (Airbus). The show consists of one day of presentations whereby speakers (like Google) in the AM cover a lot of related or informative topics while the afternoon sessions cover general areas of interest. After the break session in the morning of the first day this year, the “Branded Experience Concept” was front and center. No doubt, the discussions of airline brand strategy, by Mark Krolick were some of the most revealing snapshots of an airline we have ever seen – great job. Show visitors then had an afternoon of presentation choice (Plenary Sessions) about IFE and Connectivity, The Cabin, and Hospitality Service. We chose IFEC and we will let Michael Planey sum up his panel – “The e-Aircraft panel took a brief look at the many improvements to operational efficiency that can be achieved with the proper allocation of bandwidth and the development of new applications. 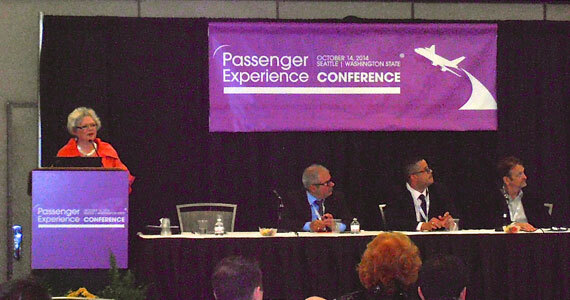 The seven panelists highlighted how both flight and cabin crews can use new tools such as tablets to receive updated weather forecasts, passenger preference information, and customs and immigration data. Perhaps the most important information, however, is that while progress is coming it will not happen at the same pace as new consumer electronics trends. Placing this new technology into the aircraft is a complex process touching almost every department in the airline and it’s more important to get it implemented correctly than to get it done quickly.” Michael Planey. Two of the many presentations on Tuesday afternoon blew us away. First one was the presentation from Pradeep Rathinam from ADITI. The company, to our way of thinking, looks at company (airline) and customer data in a new way, and their website might give you a better clue on what they do and how they do it. One quote from their website might help to understand what they do and we think it sums up their services in the travel sector: “Delivering Stress Free Travel Experiences For Your Customers – The new breed of travelers uses digital technology to make their holiday experiences better. They rely on smart devices to research more options online, pick recommendations from digitally connected friends to share and relive their entire travel experience on social media. We helped TUI change their business from carrying out one-time transactions to building lifetime relationships. This was delivered through an engaging and interactive system that answers the need of the traveller and collecting feedback at every touch point. The result was a rich, immersive and always available mobile application, which learned from users. built context, and made relevant travel suggestions.” As you may see, the company deals in data but that is only part of the story. By intercepting the customer data experience, the company serving them knows a lot about their wants and needs. The trick, of course, is interpreting the data and developing a feedback to the airline and the customer. This is what Aditi does and with 7500 employees, they must be doing something right. Don’t get too lost in the Oculus Rift product, it is only an example (and for those with a weak stomach, a moving plane is a recipe for air sickness). Rather, look at their problem/solution as a two way data environment and using onboard IFE or their devices, an airline can look at the potential for more revenue by understanding the customer better. In our opinion, there is a fine line here about how much data gathering is acceptable vs passenger privacy. We have included the ADITI presentation but don’t look at it as a “product solution for airlines”, hardly, you should focus on the customer access challenges, customer digital footprints, asymmetric data involved, immersive experiences generated, and especially Systems of Record (Cost) vs Systems of Engagement (Revenue). As aircraft connectivity becomes a reality and access to the Internet is commonplace, there will be a few smart companies (and airlines) that take a different view of customers (via their data footprints) and figure a way to deliver a “personalized, connected, multichannel, experience!” You will see more of these folks in our industry – and remember, you read it first here in IFExpress. Ben Fuller (digEcor): The weather was great and so was the show – both of which we had pre-conceived reservations about. We were also pleasantly surprised at the airline turnout. John Courtright (SIE): The Zodiac stand was by far the most impressive because they showed their ascendancy in the cabin systems market – IFE, galleys, seats, and engineering services to support their growing market share. From a numbers point of view his year, we saw an increase of visitors at AIX’s Seattle show over last year and an increase of booth floor space. To get some actual data we contacted AIX’s Marc Holloran and Katy Murphy for an update. 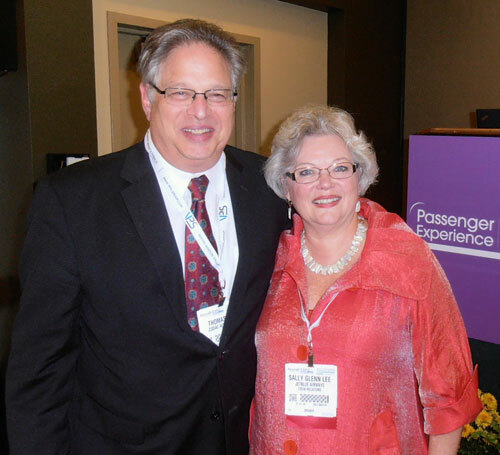 Marc told IFExpress: “Aircraft Interiors Americas exhibition and conference welcomed over 1700 attendees when it took place 14-16 October at the Washington State Convention Center in Seattle. Recognized as the region’s largest dedicated event for the airline interior and cabin management sector, this year’s exhibition included 122 companies from 14 countries, 40 of which were first time exhibitors. Representatives from over 30 airlines attended to view the latest products in IFE, seating, galley equipment, lighting, soft furnishings, leather & textiles and discuss the future of cabin interior development.” AIX further noted ”We’ve been pleased with the number of international companies and visitors at this year’s Aircraft Interiors Expo Americas, which included first-time exhibitors from countries such as Japan, Israel and France. The Seattle event saw the launch of CabinSpace LIVE, which was well attended and the Passenger Experience Conference provided an invaluable platform to discuss a wide range of key topics within the industry. We look forward to welcoming all exhibitors and visitors to Aircraft Interiors Expo from 14-16 April 2015 and Aircraft Interiors Expo Americas 2015, which will take place from 3 – 5 November,” said Katie Murphy, Event Director for Aircraft Interiors Expo. On a side note, we will have pictures of the show uploaded onto flckr in the next few days – just click on the Photos @ Flckr image in the upper right hand corner of IFExpress. On different note, no news release was submitted to IFExpress but you might find this interesting. It is an email we got from Giame Porcu at Thales: “I wanted to alert you to a news item that came out of the NBAA show here in Florida. Thales has been selected to provide it’s wireless IFE system on the Gulfstream 500 and 600 unveiled in October 2014. The Thales Wireless IFE system will be offered baseline making it the first wireless IFE to be standard on Gulfstream platforms. Operators will be able to pick from different content packages which will include the latest available content from all major Hollywood studios and global TV networks.This solution will work on both the embedded displays as well as passenger PEDs. The system bundles together the hardware supplied by Gulfstream, with the end to end solution supplied by Thales. This includes network application content and all related services. “The Thales Wireless IFE offers both flexibility to passengers and operators because it is a scalable solution adapted to different applications. Passengers can stream content to any device and utilize it’s android functionalities to access TV and movies updated periodically, with the full support of the Thales content management team.” Thanks, Giame. IFExpress readers, we would love to hear from you as well!